As part of any divorce, you will need to provide an outline of the circumstances surrounding your relationship. This involves submitting birthdates, social security numbers, and other relevant information for you, your spouse, and any children involved, along with copies of supporting documents such as birth certificates and marriage licenses. It also includes submitting a financial disclosure form through the Florida Courts, listing all property, assets, and debts. Unfortunately, in the turmoil surrounding the end of a relationship, obtaining the documents, statements, and receipts needed can prove challenging. Quietly making plans to file for divorce first and gathering the items you need before your spouse is aware or realizes what is about to happen prevents them from attempting to hide or destroy important evidence in your case. Under the Florida Statutes, there are certain procedures that must be followed before your divorce can be finalized. One of the most important, and possibly contentious, is dividing marital assets and debts. This applies to any real estate, personal property, bank accounts, or other items earned, acquired, or accumulated throughout your marriage. It also includes all of the joint debts, such as mortgages, credit cards, or car loans, you have with your spouse. 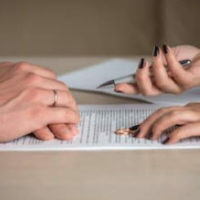 In some situations, a spouse may attempt to hide or give away assets if they suspect a divorce is imminent, to prevent their spouse from getting them in a divorce settlement or order. They may also go on a wild spending spree, accumulating debt as a way of exacting revenge. By filing for divorce first, which provides an inventory of all property, assets, and debts you possess, you can help to ensure your financial interests are protected. Additionally, while marital misconduct is not grounds for divorce in Florida, it can be a factor in property division and alimony proceedings. Taking your spouse back after an affair or other type of misconduct is referred to as condonation, which means it can not be brought up at a later date. To discuss your options and the potential ramifications of a divorce in your situation, reach out to the law firm of attorney Vanessa L. Prieto. To request a confidential, one on one consultation, call or contact our Fort Lauderdale divorce attorney online and request a consultation today.